Either log onto easyfundraising via the easyfundraising toolbar and select the shop you want to buy from and you will go to their home page and anything you buy the Club will benefit. Or log on via the easyfundraising.org.uk home web page and select the retailer and start shopping. Diamond League @ Hampden Park!!! Hampden Park before the Commonwealth Games! The world's best athletes are set to head to Glasgow two weeks before the Commonwealth Games for the Sainsbury's Glasgow Grand Prix at Hampden Park on July 11-12. The event, which forms part of the prestigious IAAF Diamond League, will see the world's second fastest man of all time over 100m, Yohan Blake, go up against Britain's Adam Gemili, World Indoor 60m champion Richard Kilty and 2003 world 100m champion Kim Collins on July 11. Double Olympic and world champion Mo Farah will grace the track on July 12, where he will be joined by the likes of Olympic champions Greg Rutherford and Christine Ohuruogu. Tickets are now on sale, so for those who have missed out on Commonwealth Games tickets, this is your opportunity to see the world's best athletes in action! Buy your tickets today by clicking HERE or call 08000 556056. * 10% group discount offer available for a transaction of 10 tickets or more! Call the group booking line on 0844 844 2121.
scottishathletics cannot deal with any ticketing queries for this event. For more information on the Sainsbury’s Summer Series please click here. On International Star Wars day (May the 4th be with you) some of our young athletes from East Kilbride Athletic Club made a great start to the season. There were some fine performances, some personal bests and even a Club Record. 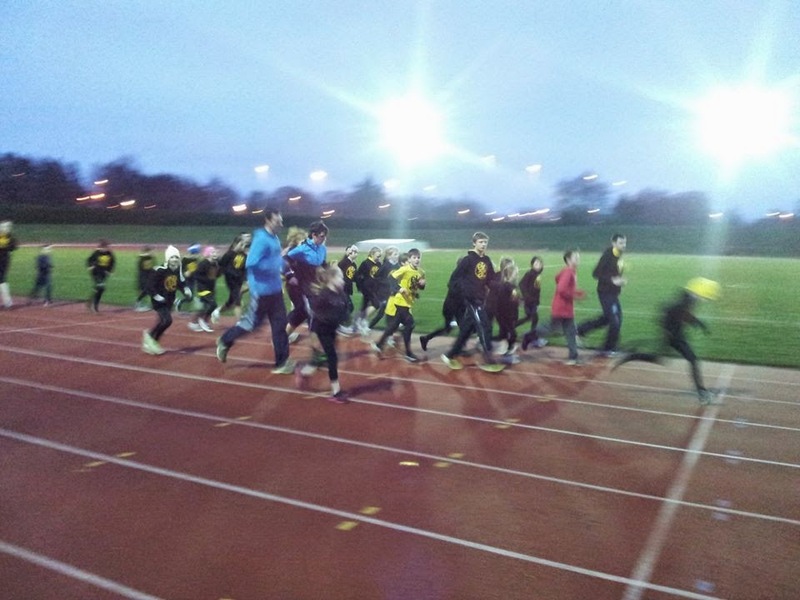 Following a highly successful winter cross country and road racing season East Kilbride Athletic club turned its attention to track and field on Tuesday 1st April. Keen to test the fitness their young athletes had worked hard on all winter the coaches devised a middle distance time trial, primarily for the younger members of the club. To make the evening more interesting the senior mens’ squad agreed to act as pacemakers to help the racers target personal best times. The change to lighter evenings was accompanied by a brief respite in the wind and rain providing reasonable conditions, if a little cold. The evening was kicked off with the under 11s running 600m over two heats. The youngsters were all desperate to run as fast as possible with Cameron MacDonald and Holly Coutts deciding after 100m that the pacemaker simply wasn’t fast enough and leaving him in their wake. In spite of grim predictions from their coaches Cameron maintained the blistering pace to record a time of 2:01:2. Not only was it the fastest 600m of the evening, it was also third fastest by an under 11 in club history. Holly fought bravely to the end but was pipped, by a second, on the line by Abbie Kirwan who stormed the final 100m to record 2:10:5, again third fastest on the record list. 800m was the distance for the under 13s and above, run over 3 heats. A number of gutsy performances were on display in the first two heats with pbs being decimated all over the place. The greatest improvement on the evening went to Hannah Dickson who knocked 24 seconds from her previous best time. The final heat was hotly anticipated as the club’s big guns lined up for a crack at some already impressive times. At under 13 the best time was recorded by Owen Selfridge, running a strong, consistent two laps to record a pb of 2:37:6 on his first day as an under 13. Sarah Connolly ran an equally strong race to finish in a pb of 2:44:5 as fastest girl. Under 15 races were won by Matthew Kirwan in 2:53:8 and Chloe Mulligan who is used to much shorter distances in a pb of 2:53:2. Under 17 Honours fell to Kyle Fenix, another short distance specialist, in 2:38:1 and Rachael McCusker in 2:58.5 both pbs. The fastest time of the evening was set by under 20 Shannon McMahon who ran an impressive 2:33:6, just behind pacemaker Jamie Clements who won bragging rights over his team mates and a small prize by hitting his target exactly with a time of 2:30:0. The aim of the evening was to test the athletes current form. With over 40 pbs from 46 runners the coaches agreed the hard miles in wind, rain, snow and mud over the winter were well worth the effort. Thankfully the athletes and spectators all enjoyed the ordeal as well. Well done to everyone involved in a great opening night to our track and field season. Our inaugural EKMC meet produced 43 (yes forty three) PB's. Thanks to all officials, pacemakers, coaches and athletes. 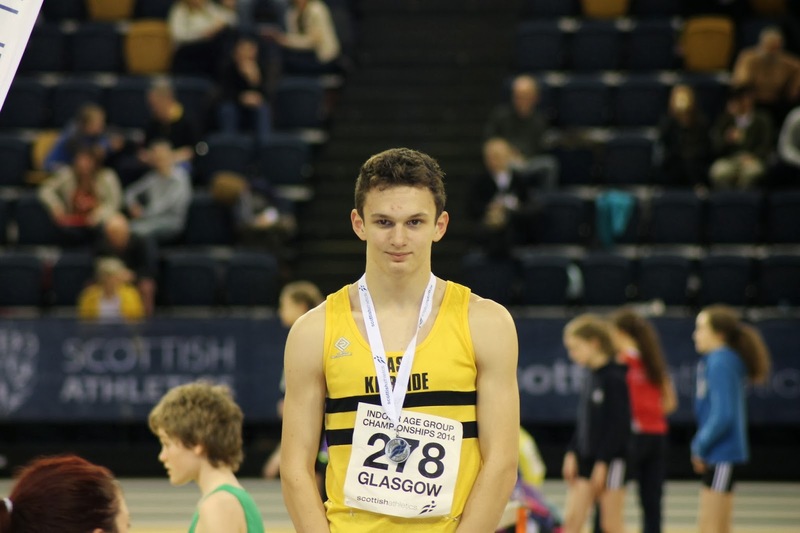 Greg Kelly won the silver medal in the under-16 60m in a new PB time of 7.48 seconds, only finishing behind the record breaking Michael Olsen of Edinburgh AC. 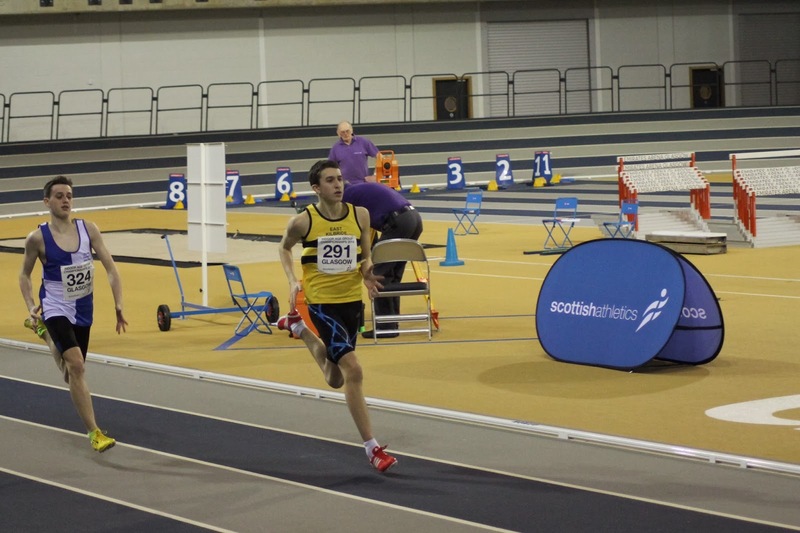 Greg (14) also finished fourth in the 200m in a time of 24.16, just outside the PB of 24.05 he set at the Scottish Schools Indoor Championships. Greg also plays football for Westwood Rovers, who are in the last four of the Scottish Cup for their age group. Callum Field made the step up to 400m and won a silver in the under-16s in a time of 54.64 seconds, a good performance by the 14-year-old after a slightly interrupted preparation. 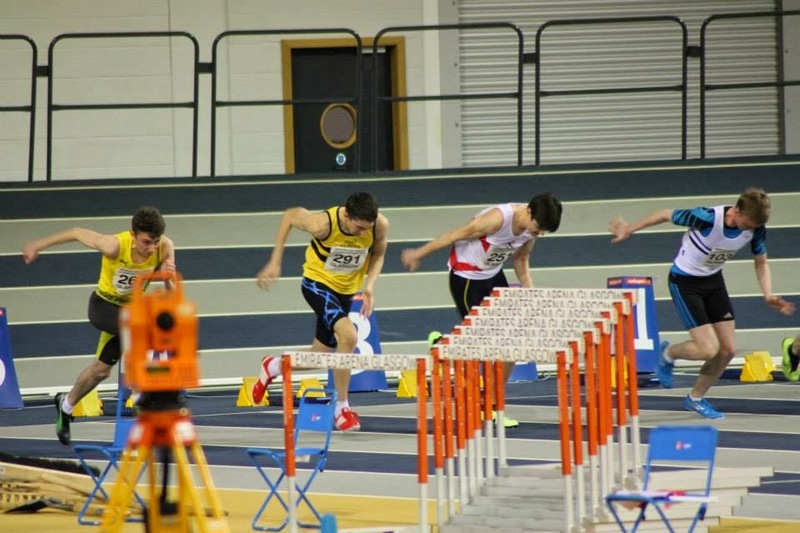 Callum has had a good winter and recorded a PB time of 54.53 seconds in January after reaching the finals and picking up prize money in the youths' 60m and 90m races at the historic New Year meeting at Musselburgh racecourse. Shannon McMahon (17) is one of EKAC's unsung heroes and she won her seventh medal at Scottish Schools / Scottish Age Group level with a battling bronze in the 200m at under-20 level. Shannon is looking to move up to longer distances but found she had enough speed in her legs to record 26.91 seconds for third place, an indoor PB. Nicole Sharpe (14) made the semi-finals of both the under-16 60m and 200m, equalling her PB of 8.60 in the 60m. Her time of 27.98 in the 200m was just behind her PB mark of 27.58 set at the Scottish Schools Indoor Championships, where she again reached the semis. Aidan Gilbride (16) Aidan won his 800m heat in a time of 2:00.13 to qualify for final. In the final he was in contention with two others around the last bend for a shot at the medals unfortunately after a little barging ensued (which Aidan bore the brunt of) he finished in 4th place in a time of 1:59.42, just ½ second off his PB. Two former EKAC members who train with the EK sprint squad dominated the 60m for under-20 women. Arlene Barr has had a breakthrough winter and recorded a PB of 7.84 seconds in her heat before winning the final in 7.88 from Laura McCracken, who finished second in 8.01. Another athlete who has started training with the EK endurance squad (Heather Addison) picked up a silver medal in the 1500m final. Alisha Montgomery and Chloe Mulligan also ran well over the 60m and 200m, a week after Chloe had set a new 200m pb of 28.19 at the scottish schools the week before. Mixing it up with the country’s best was good preperation for their summer season. Ryan Clydesdale also competed in the 200m and set a new PB of 28.00. The club’s junior section where taking their first footsteps into national competition. Competing in the under 14 age group to gain experience at national level which will stand them in good stead for future national competitions. Over the 60m and 200m indoor PB’s where set left, right and centre by: Owen Selfridge, Josh Haughey, Lara Brown, Jessica Hagan. Over the 800m more indoor PB’s set by Sophie Forsyth (2 mins 56 seconds) and Thomas McCourt (2 mins 47 seconds) whilst Calum Hopkins also had a solid run over the 800m. Next up for East Kilbride’s athletes is the Scottish National Cross Country Championships on Saturday the 22nd of February. These championships will have a special feel about them as EKAC’s greatest cross country runner; Alan Partridge (64) will be lining up alongside the senior men’s team. East Kilbride Athletic Club were delighted to host the newest races on the Scottish Athletics Cross Country Calendar recently with a full programme of events held at O’Cathian Farm, Hay Hill Road, Jackton. In conjunction with the East Kilbride Community Trust and landowner Mr James Kean EKAC the club proceeded to host one of the most traditional cross country courses seen in recent times. With almost three hundred competitors braving the elements the club declared the event a complete success and look forward to making this an annual event. The Senior Men’s race was won by Mark Pollard (Inverclyde) after a good battle with Robert Gilroy (Cambuslang) and Cameron Wilson (Kilmarnock) took the bronze medal in third place. In the Senior Ladies event Kara Tate (Kilmarnock) finished strongly to take a close victory from Lisa Finlay (Dumfries) with Carole Setchel (Shettleston) taking third place. There were also age group races for both boys and girls and the winners in each event were: Boys Under 11 Elliot Bain (East Kilbride AC), Under 13 Scott Sprang (Ayr Seaforth), Under 15 Ryan Gray (Inverclyde) & Under 17 Men Aidan Gilbride (East Kilbride AC). Girls Under 11 Alisha Sivell (Kilbarchan) , Under 13 Emily Crusher (GiffnockNorth), Under 15 Nikki Miller (Giffnock North) & Under 17 Women Nicole Scott. Jim Orr (Cambuslang) - Thanks to everyone involved at East Kilbride Athletic Club today for their hard work and effort in putting together an excellent day's cross country racing. Well done folks! Colin Partridge (Lothian) - Really enjoyed the race today. Mud glorious mud! Neil Walker (Kilmarnock) - Great event today guys, good turnout, very tough course! George Pettit (Cambuslang) - Thats what you call a cross countrycourse,Great event will be back next year. Alan Sprang (Ayr Seaforth) - Congratulations on a well run and great event. It was good to see a traditional cross country course for once. Pity there’s no more like it. I hope you will run the event again. With such positive feedback the club will be delighted toliaise with the East Kilbride Community Trust regarding making this an annual feature in both the sporting calendars of the town of East Kilbride and Scottish Athletics.